Secondary Offering - What Does It Mean? What is a "secondary offering"? 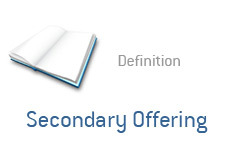 What is the definition of a "secondary offering"? A secondary offering is done by a publicly traded company. The reason why it is called a "secondary" offering is because the company has already offered shares to the public via an "initial public offering". 2. A secondary offering done by some of the major shareholders in the company (in order to sell some of their shares). In the first case, NEW shares of the company are being issued. This dilutes existing shareholders and raises the total number of outstanding shares in the company. In the second case, only existing shares of the company are sold, meaning that existing shareholders are not diluted. Secondaries are sold through an investment bank (or banks) who underwrite the offer. These banks are responsible for securing buyers of the offering, and in return are given an allotment of the shares. Is Sears Going to Declare Bankruptcy?